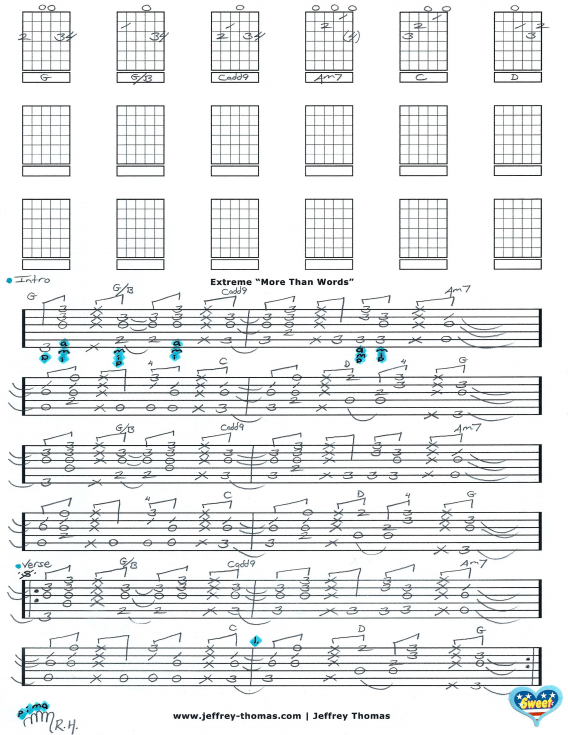 Extreme More Than Words Free Guitar Tab by Jeffrey Thomas. I have the complete song structure, chords, fingerpicking details and rhythm for this classic acoustic ballad. Many of my guitar students enjoy learning this acoustic guitar classic. It is a great tune to know for gigs or campfire sing-a-longs. Want the full guitar tab for free? Send in your email address on the form provided and I’ll send it to you. Looking for online guitar lessons? Fill out the Schedule A Free Lesson form to set up your free Skype guitar lesson today. This acoustic ballad was a major detour from Extreme’s funk metal style and has been called a blessing and a curse for the band. Find more free online guitar lessons on my tab, blog and video pages.